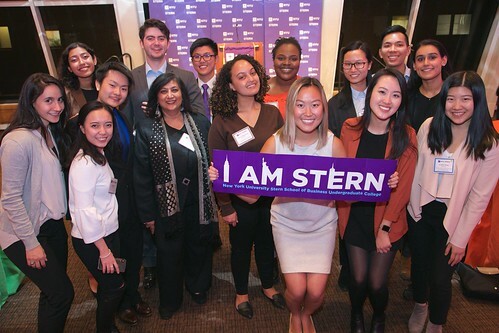 NYU Stern's generous scholarship benefactors and their accomplished recipients came together for the 7th Annual Scholarship Reception. Bill Berkley, BS '66, Chairman of the NYU Board of Trustees and Chair Emeritus of the Stern Board of Overseers joined us, along with NYU Trustees Bruce Berger, BS '66, and Chandrika Tandon (NYU Trustee and Stern Board of Overseers member) and Stern Board of Overseers members Ed Barr, BS '57, Jerry Cohen, BS '53/ MBA '59, and Jack Kassin. The evening began with opening remarks from Dean Raghu Sundaram who shared a few of the exciting innovations taking place at Stern and gratitude toward the scholarship donors. Undergraduate College Dean Geeta Menon highlighted the strength of the undergraduate college in attracting the best and brightest students, and recognized the talent and accomplishments of the scholars in the room. Esteemed scholars Mahum Yunus, MBA '18 and Dana Li, BS '18, spoke about the impact that scholarship support has had on their Stern experience and the strength one gains from the feeling of someone believing in you. Donor speakers, Jerry L. Cohen, BS '53/MBA '59 and Kathleen A. Corbet, MBA '89, also spoke to the transformative power of scholarship on their own lives and how proud they were to help support future generations of students.